I have been meaning to put up a little review of this one for ages. My understanding is that Neil started having a bit of an experiment with making a few guitars in conjunction with his local luthier further to what sounds to be a very healthy LP JNR obsession/addiction! Anyway, this gtr absolutely rocks, it is simply superb. The neck is wonderful, big, chunky and full. The frets have been rolled so it feels lovely and played in and for my taste the feel of it is just perfect. I have no idea how easy or difficult it is to build something like this but the result is such a wonderful thing. Everything works really well. The p90 really roars but isnt at all over the top. I found myself absent mindedly hammering something out on it (through a 70s marshall MV combo : perfect combo!) when suddenly I realised it had exactly Thunders' tone on Chinese Rocks. Haha..very cool. It also does Leslie West! The best thing is that its such a wonderful gtr to play but also, just isnt too posh that I have to worry about it. A ding or two isnt going to make any difference - I wont be suicidal if I scratch it or bash it. The quality is superb and if it got nicked or broken I'd be straight back on the phone to Neil trying to build another one! Cheers Neil for this instrument, its ace. 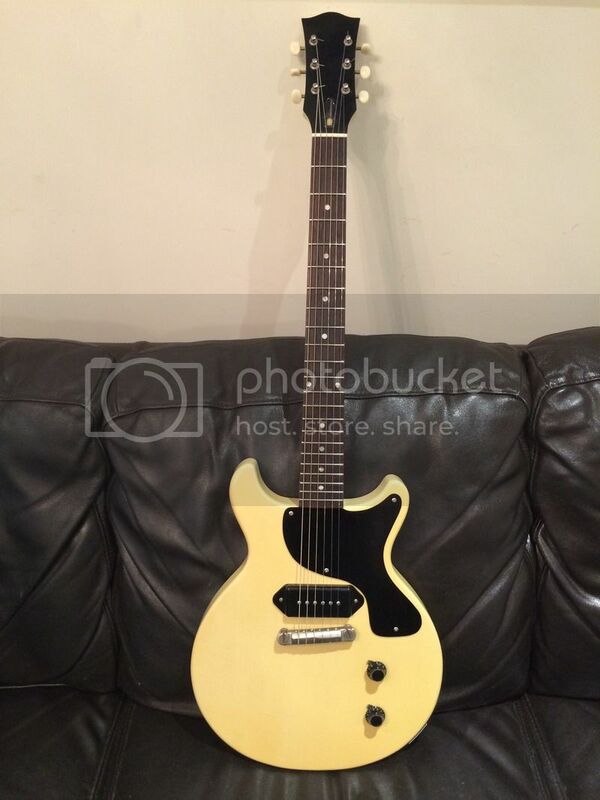 If Neil puts anything similar up for sale in the future I'd definitely recommend anyone who likes chunky necked, rocknroll guitars to go for it! Right, thats enough nonsense, I'm off to play to again. I think I left it on the kitchen table when I was playing whilst making the kids' tea..its THAT sort of guitar - just wonder round the house with it, not precious, not posh, just brilliant! Many thanks Will @Scalino65 for the kind words. Basically I have been working with a local luthier to me to try and build the ultimate gigable vintage spec Junior. I used my own '59 Double cut and also another '59 Double Cut (which now belongs to @Trotter) for the measurements and, through my own experience, being a Junior 'nut', found the best (IMO) hardware, pickup and electrics combinations. Unfortunately My luthier pal has recently decided to retire so there will only be a very limited number of these guitars available in future. I do have another DC Junior near completion, in a very fetching All Gold Vintage Goldtop, which will be in the classifieds pretty soon if anyone is interested. I know I'm late to the party (new around here), but that looks great. Always fancied a Jr Double Cut and the TV Yellow finish is cool. I've seen another thread as I'm working my way around the board with @GSPBASSES making some Jr's. Seriously nice work all round.